Do you currently use Helpdesk software? Whether it’s because you need to troubleshoot your internet connection or return a pair of shoes, nearly everyone is familiar with help desks. Just as the name suggests, they are a beacon for guidance. As technology advances, people ask organizations for help through an increasing number of channels: phone, website, instant messaging, email, social media, etc. With so channels to monitor, issues can easily slip through the cracks. This is where help desk software vendors come to the rescue. In the simplest terms, help desk software (HDS), sometimes called customer service software, ticketing systems, or IT service management (ITSM) software, helps businesses automate service management. These services are either used externally by customers who have bought goods or services from you or internally by employees who need assistance. Email and spreadsheets will only take your business so far; to truly improve employee productivity and customer satisfaction, your business needs help desk software. In order to help you compare solutions and choose the best help desk software vendor for your business, this guide will cover system features and functionality, common use cases and leading solutions, and how to garner support from the C-suite. Help desk software varies greatly in both functionality and use cases. Sometimes referred to as issue tracking software, help desk solutions provide a central platform where staff, network users, or customers can report issues through phone, email, live chat, or social media. These issues and requests are automatically logged and prioritized into a ticketing system, then reported to IT administrators, web developers, customer service representatives, and/or other relevant employees. This centralization and automation saves time and effort associated with manual troubleshooting, increases employee productivity, and improves customer satisfaction. 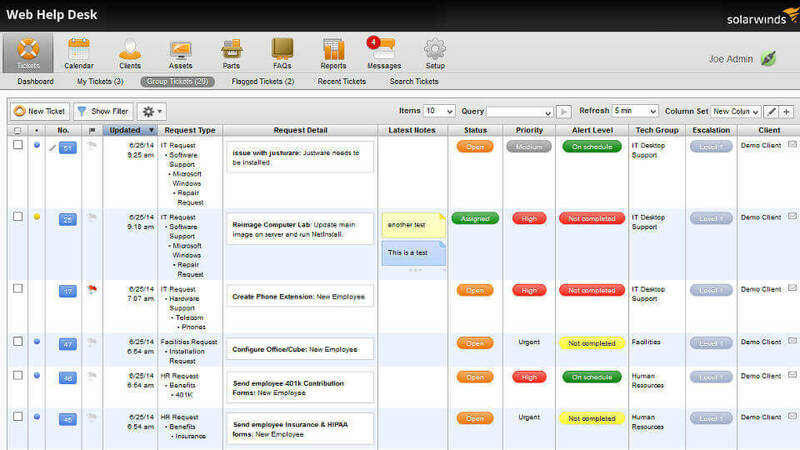 Help desk software goes beyond troubleshooting by offering smart tools for automating the resolution process, such as auto-assign features (allocate tickets to specific technicians based on skills required or issue type) or shared macros (predetermined fix actions auto-prescribed for a simple or recurring issue). Additionally, many provide self-service resources for your staff and customers to relieve the burden of troubleshooting. Lastly, reporting and analytics tools offer valuable insight about your help desk operations, such as average resolution times, trends in past tickets, user sentiment, etc. Better problem tracking and organization from help desk software leads to reduced service costs, increased customer and employee satisfaction, and improved knowledge sharing. Organizations of all kinds can use help desk software, either internally, externally, or both. Since the use cases are so varied, let’s examine common applications in order to paint a clearer picture of the many ways your business can use this technology. IT help desk software enables companies to swiftly address IT concerns and crises of any level: if an employee has computer issues, a manager needs additional tech resources, or someone spreads a virus to the entire team. Help desk software can streamline issue resolution and improve operations by minimizing employee downtime, prioritizing and escalating issues, and reducing requests with self-service knowledge bases. In addition to core functionality, look for asset and network management features when choosing a help desk solution for IT. HR teams can use help desk software to eliminate data silos and help teams perform administrative functions. For example, if your company wants to encourage, and even amplify, conversations with employees and HR team members, help desk software allows them to ask questions, submit requests, or provide feedback. You can also automatically route inbound communications to the correct HR specialist, and track, share, and report on tickets. As your business scales, so will inquiries about payroll to questions about immigration or benefits, or requests for passwords to HR systems. HR help desk software can help manage these requests. 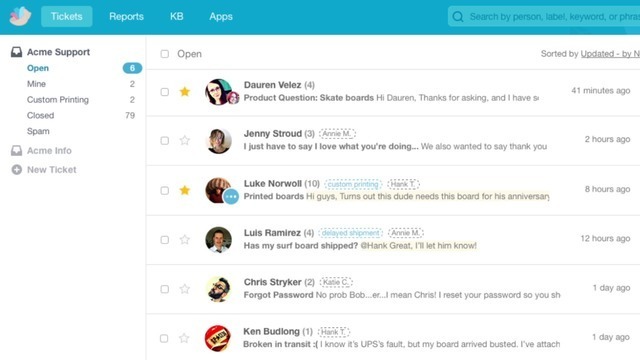 Customer service help desk software brings all consumer conversations into one place. This can include IT problems, or they may only focus on customer issues. These systems bring email, social media, voice, and online chat into one central platform to help resolve customer issues that range from exchanging retail merchandise to reporting a software bug. Customer service help desks greatly benefit from a knowledge base or community forum where customers can answer their own questions. Additionally, you may require integration with existing systems such customer relationship management, marketing automation, social media marketing, or call center software. 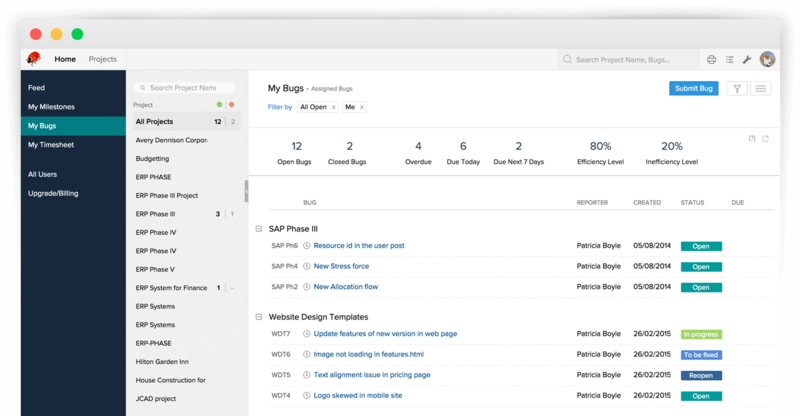 Bug tracking software is at the intersection of IT, customer service, and project management software. This solution goes beyond simple ticketing by integrating with your project management software to track client issues and send them to the product or software development team. These solutions often offer tagging and automatic notifications so issues can be prioritized and customers are contacted when bugs are resolved. Free help desk platforms often come with limitations, and many free versions are scaled-down systems that work as little more than a free trial. Some small businesses may find them useful if they have limited admins or users. You’ll want to check the specifications, user limits, and eventual price points if you need to upgrade before you move your help desk solution to a free version. Your company’s financial experts are most concerned with the upfront costs of new technology, how it can improve the company’s bottom line, and what — and when — the expected return on investment will be. In addition to the cost analysis for a new help desk system, be sure to mention how the software can financially benefit the company. Two areas of particular interest to CFOs will be asset management and data. Help desk software with asset management can help keep IT and finance departments on the same page by tracking inventory of company tech such as servers, printers, computers, and any other IT asset. This feature primarily helps the IT department identify IT assets, as well as produce reliable and actionable reports from several branches globally. Help desk software not only provides insightful data on IT assets, but for the entire help desk process, too. By analyzing incoming issues, resolve times, and inquiries per customer, help desk software helps resolve costly issues proactively, rather than reactively. The leader of your organization is focused on the big picture. They want to know how help desk software can improve the overall business and keep your organization ahead of competitors. IT professionals know that technology questions, troubles, and breakdowns can be time consuming and expensive. Oftentimes when a solution is created, so are a dozen new problems. To track both internal and external technology issues and requests, businesses need a dedicated platform. Since the IT department is always busy putting out fires, automation and self-service features are key to reducing requests. While live support shouldn’t be eliminated, held desk software can automate numerous workflows and issues, which frees up IT skills and resources to be redistributed to more pressing matters. AdRoll a global leader in retargeting, a type of digital advertising particularly effective in connecting companies with prospective customers. This sudden growth required a tool that would allow the 20+ person Customer Delight team to scale their services. AdRoll needed a help desk solution that not only enables the team to resolve issues quickly, but also supply crucial data to the business. Gurdus was drawn to Zendesk for their ease of use and fast issue resolution times, but it was the data Zendesk provided that convinced him it was the right solution. “Typically, a customer service solution is helpful from a reactive standpoint,” Gurdu said. “But we wanted to change that up and be proactive in the way we deliver customer service.” To do that he needed data that would inform decisions on everything from international staffing to product design. AdRoll also needed to integrate their existing CRM and ERP software with the new help desk, so that employees in different roles can easily share customer information. In the end, AdRoll chose Zendesk for more than their functionality. Gurdus liked the similarities he saw between the two companies: both are fast-moving and agile, and both are able to ship new products quickly, continuously improving both their service and their customers’ experience. Improved collaboration with product team: their campaign review process was streamlined, so new campaigns get approved faster. This also led to improvements that made the customer dashboard more intuitive for new customers. Zendesk is a tiered help desk software, which makes it suitable for small or enterprise businesses alike. They were the best software to meet the needs of AdRoll, but another vendor may be best for your company’s unique requirements. Browse more options by using our help desk software Product Selection Tool (above), or view the help desk software reviews of various systems in the reviews tab. If you’re curious about any of the help desk products or features listed in this guide, we’d love to talk to you. Call one of our in-house specialists for a free consultation, or use the Product Selection Tool above to get a personalized recommendation.